The classic red version of the now widely recognised ministry of information posters produced and distributed during the early stages of World War II. 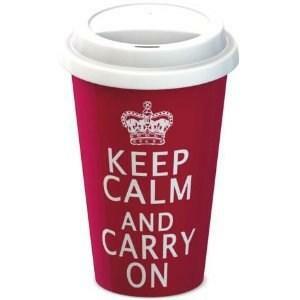 The mug features the wording and advice: "Keep Calm and Carry On". This fantastic travel mug hold 275ml, and its standard size will fit most in-car and in-vehicle beverage and cup holders. It can also be used in the garden, down the beach and at work. The silicon lid and ceramic mug is dishwasher safe. So why not make a real statement whilst being eco-friendly at the same time?